P.S. If you want to complete your Blue Waters Mint coin collection, it's a great time as I am getting close to running out of some issues. .57 GRAM .999 SILVER HALF PENNY - ONLY 90 ERROR COINS. 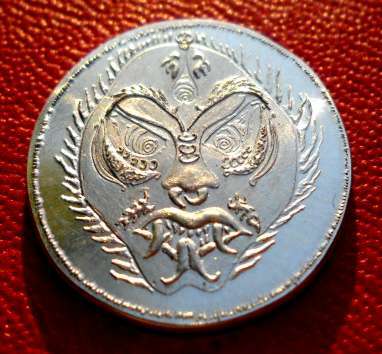 This lovely 8 gram coin is designed by hand by Arion The Wanderer who handled the striking by hammer striking these stunning coins. 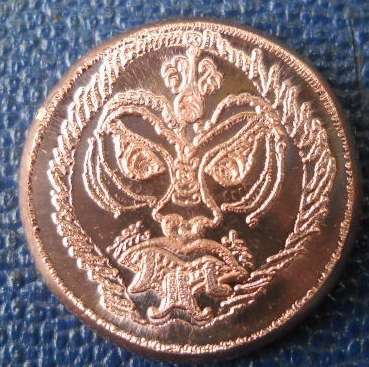 You can see by the above photos, his expertise in design and precision in striking makes him easily one of the greatest talents in handcrafted coins. These are now on sale in the web store! 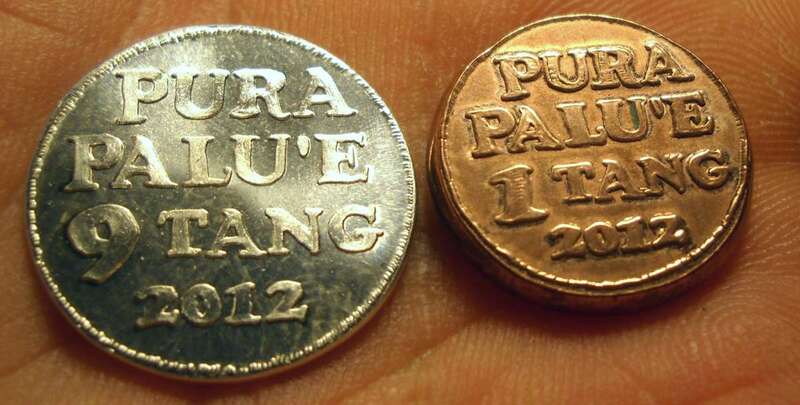 ABOVE, The Brand New (release date 1 September 2013) 1/2 PITIS of I ELA KUAI weighing in at 4 grams and about 17 millimeters. Only 100 in the first minting. 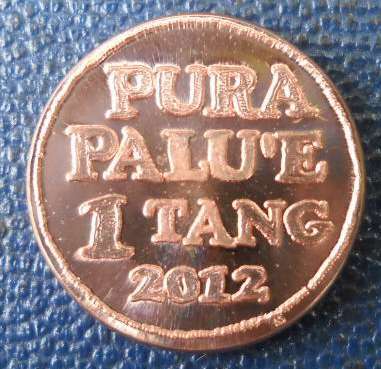 ABOVE: The New Purepuran 1 Stuiver dated 2012. This 28 millimeter 14 gram copper coin is mint fresh. 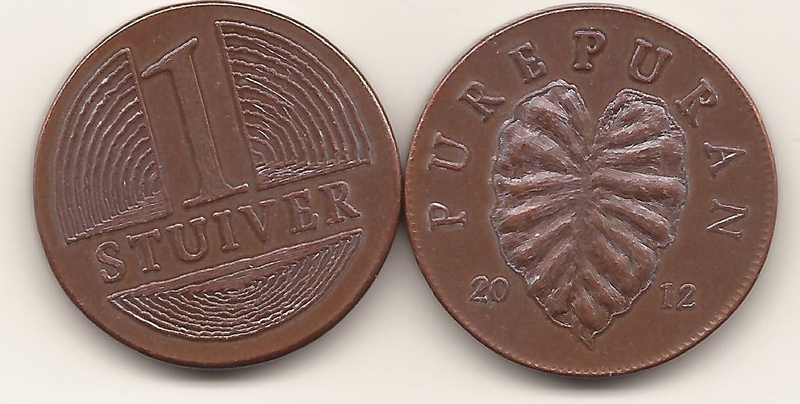 Designed by Tom Maringer of Shire Post, the coin was tumbled to offer a circulated milk chocolate appearance while being uncirculated. ON SALE IN WEB STORE NOW. 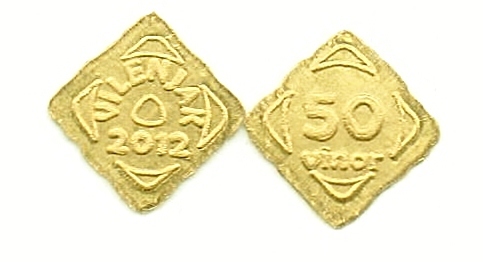 2 grams, about 15 mm. 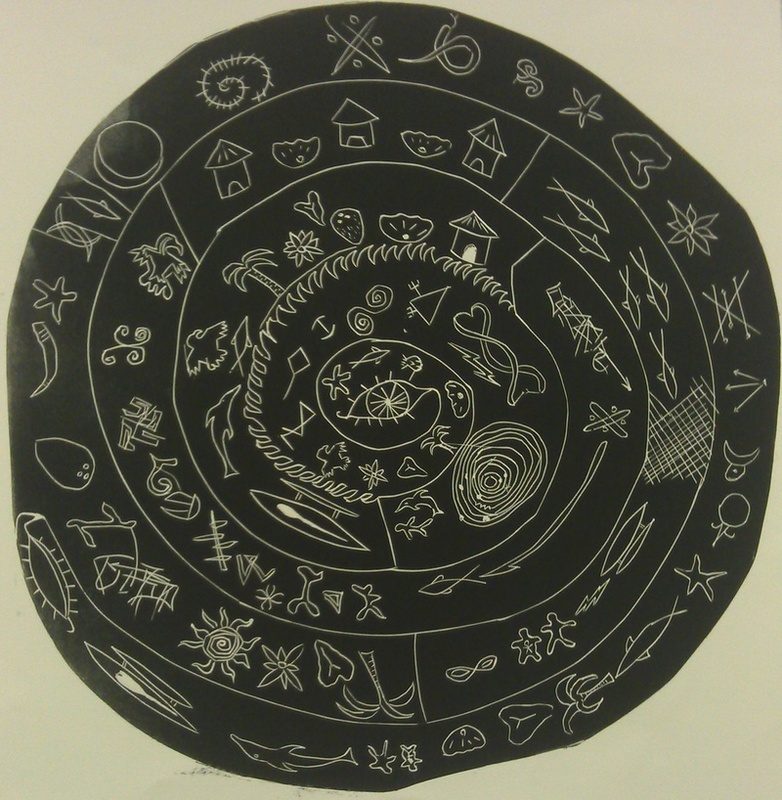 Kjelshus Collins is the artist that has created the shoreline scene of a coconut palm, the sea and setting sun and for the reverse, let's call it a tropical island version of the Phaistos Disc. See the Nukulani story in the right column. 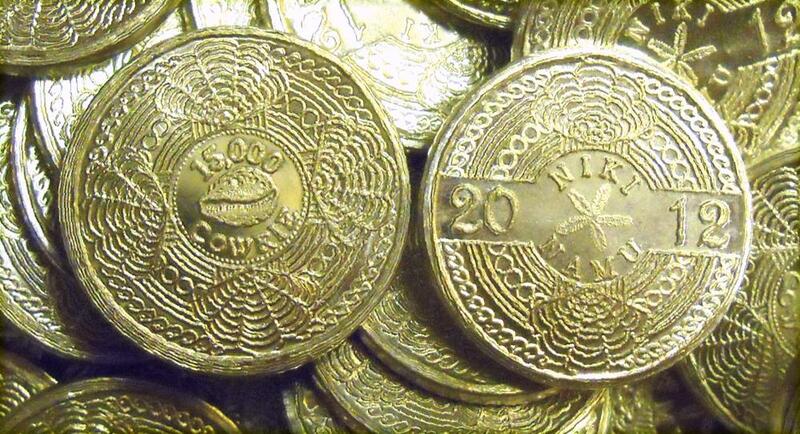 KIALUA CEREMONIAL PAKU COIN IS HERE! 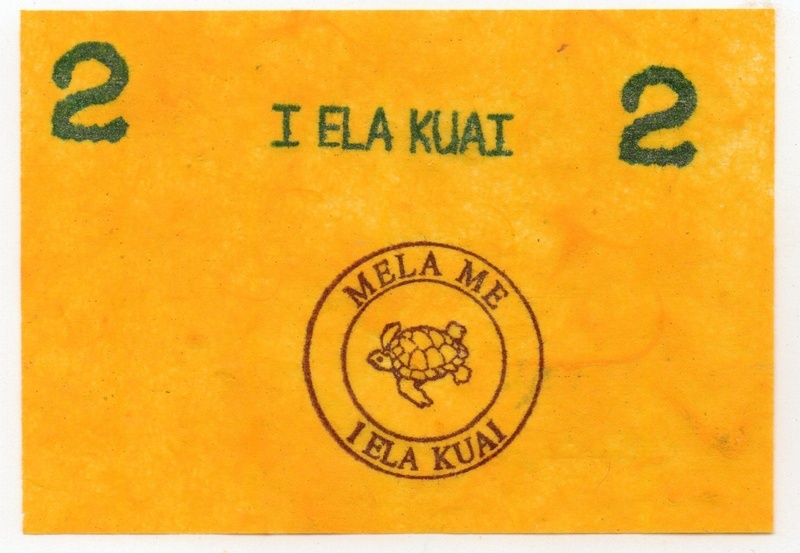 Kialua, an island known for its shell money used in traditional ceremonies and weddings was forced to convert to metal when the traditional shells became unavailable. 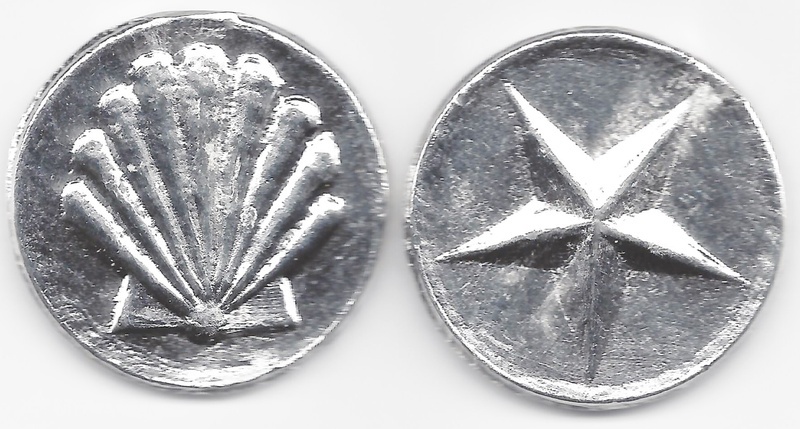 The shell symbolizes the traditional shell coin. 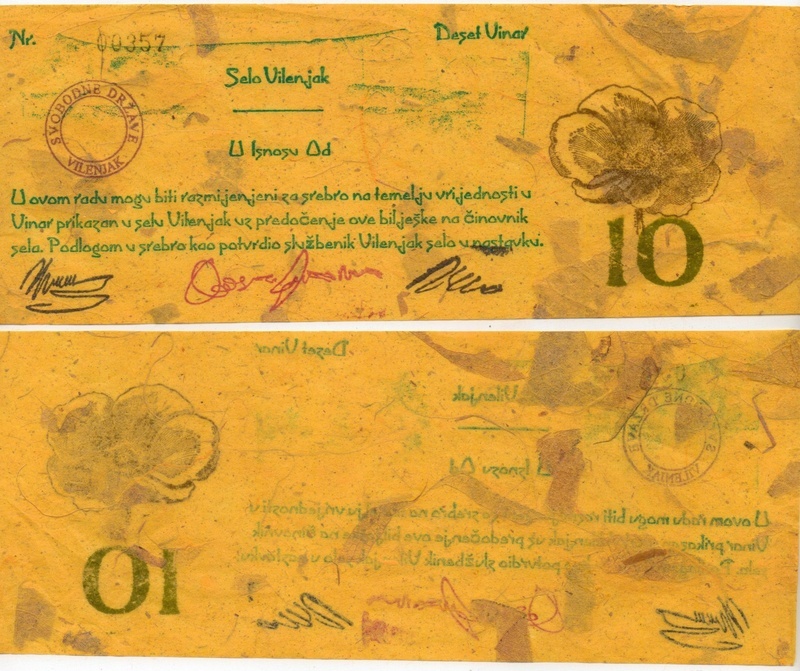 The shell money had a 5 pointed star to designate the 1 Paku denomination. The star indicates the honoring of one's ancestors through honoring the traditions. 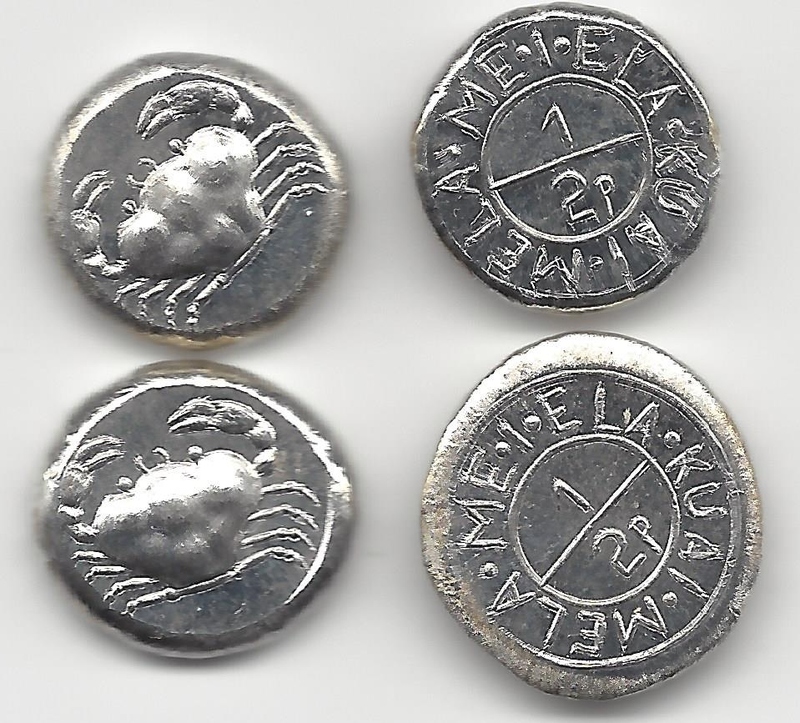 With both images on the metal coin, the largely illiterate villagers who buy the ceremonial money needn't lettering to show this is shell money honoring tradition and valued at 5 Pitis or 1 Paku. 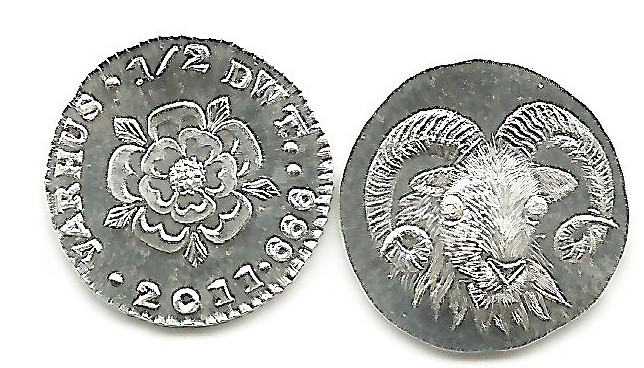 These coins are about 24.5 grams of Pewter, are made through the cast process and are about 36 millimeters. You can take a look at the Kialua story at right. The coin is available for purchase in the web store. The Juliana Island 150 Reis at 6.66 grams of .999 silver, easily our most lovely coin to date. This is a klippe brakteat at 34 millimeters square. 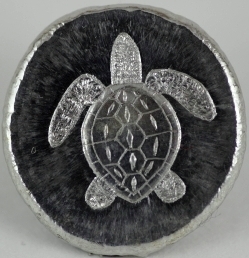 Notice the single coin standing on its side to show the thickness of this coin ON SALE IN THE WEB STORE! 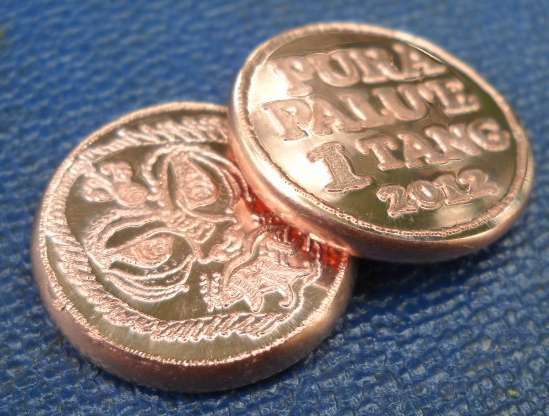 Above and below shows the 1 Tang in copper and 9 Tang in silver to show sizes. 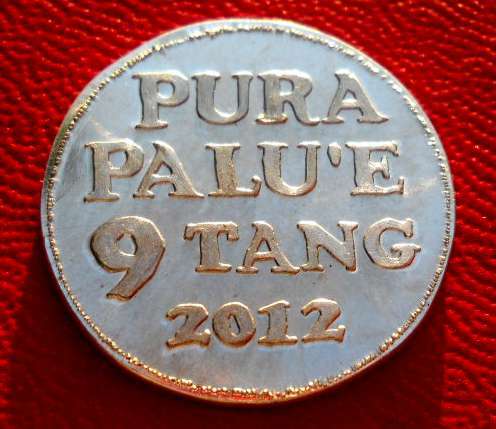 PURA PALU'E 1 Tang wood coin NOW ON SALE in Web Store. 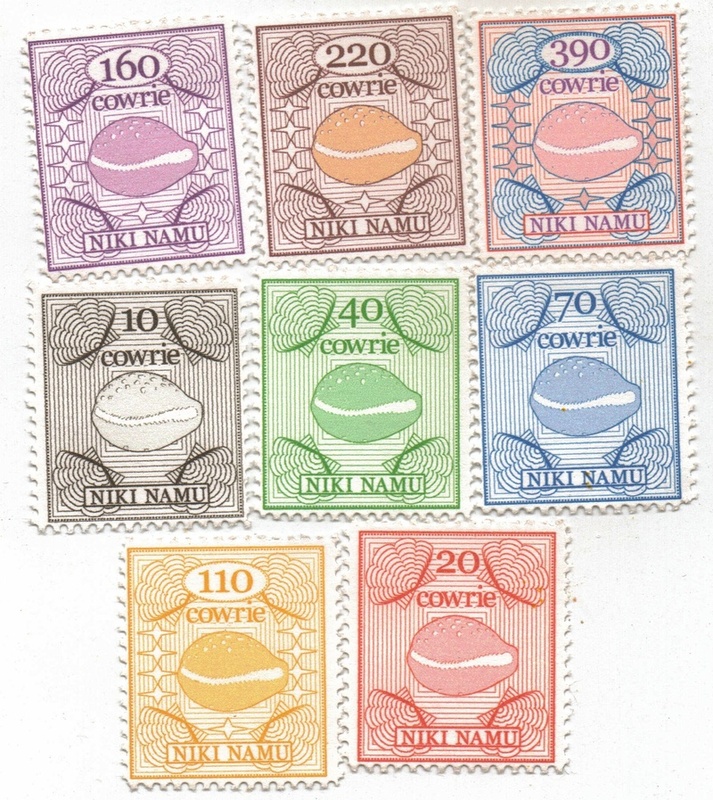 NIKI NAMU STAMPS - Set of 8 - only 8 sets on hand. See web store for details. GREG FRANCK-WEIBY TRIBUTE COIN IS ON SALE - 100% of the price goes to help establish a museum of Greg's work... Buy it in the Web Store. VERY Few remain. 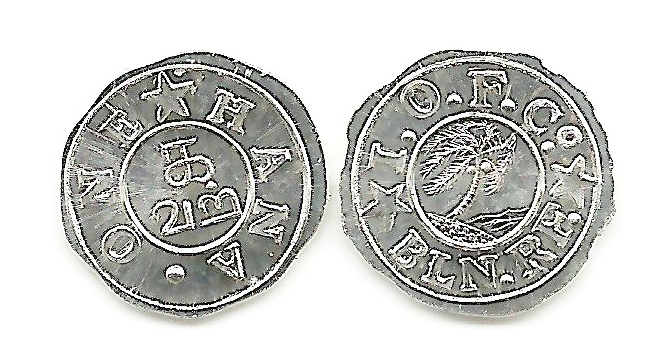 VALEMAA 1 Pfennig NOW ON SALE IN WEB STORE for April 1 release, shown in photo below. 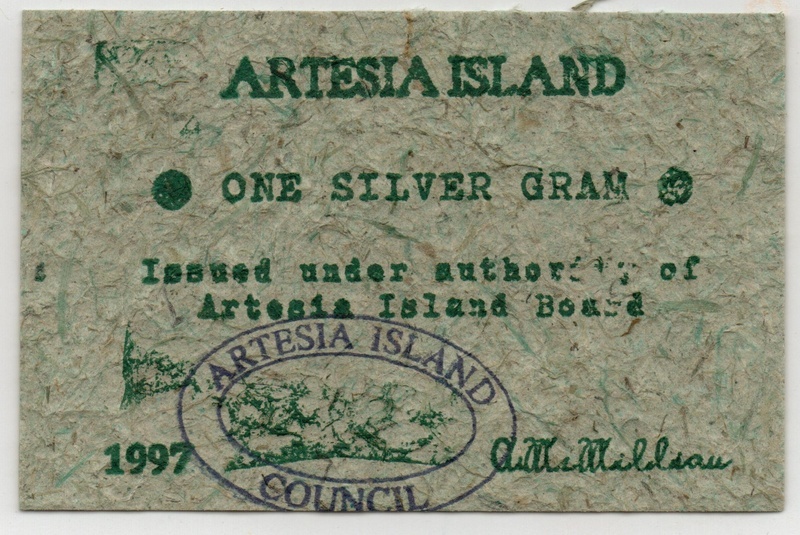 This is a half gram .999 silver, 14 millimeter coin. 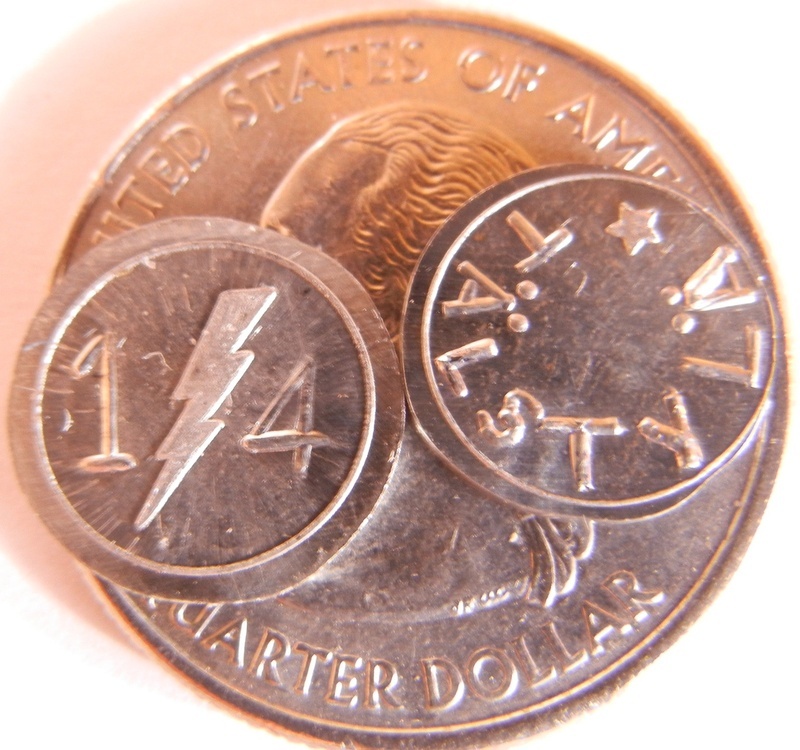 OF SPECIAL NOTE: The 1 Pfennig has a mintage of 500 done in two different runs. The result is TWO DIFFERENT LOOKS. Why? 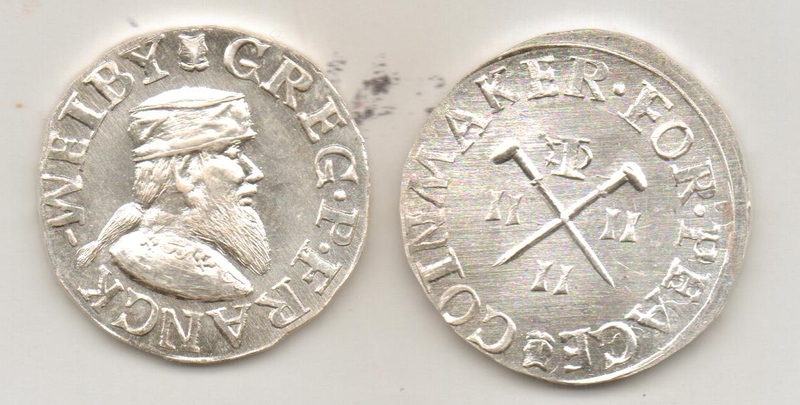 The minter, Tom Maringer, wanted to give these .999 silver coins a chemical bath to try to offer some greater depth or three dimensional look to the coin. The chemical bath added a bit of a coppery appearance to the lines in the design. Certainly you will want both as the difference is very distinctive. 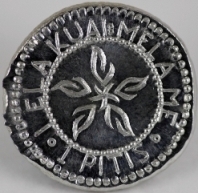 I'M POSTING A KLEF RARAHA COIN ON THE KLEF RARAHA PAGE THAT IS FOR SALE. 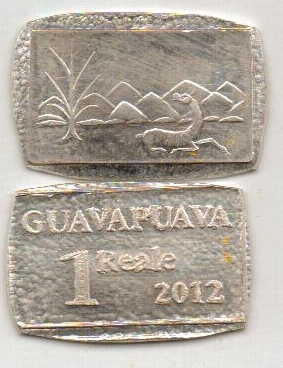 Above and below is the Guavapuava 3 Reales, the above shows the final work done by Greg Franck-Weiby before his passing. 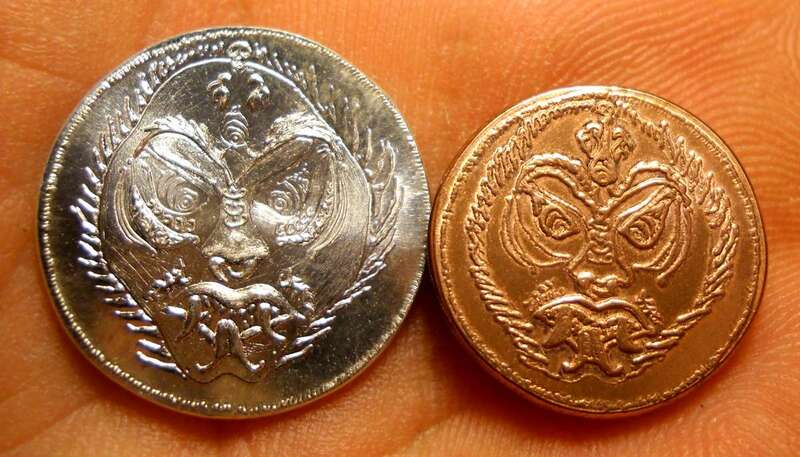 This coin is 5.5 grams of .999 silver and 27 millimeters. 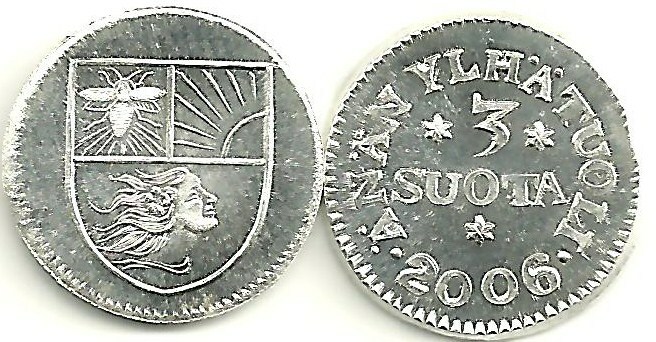 First minting is 100. 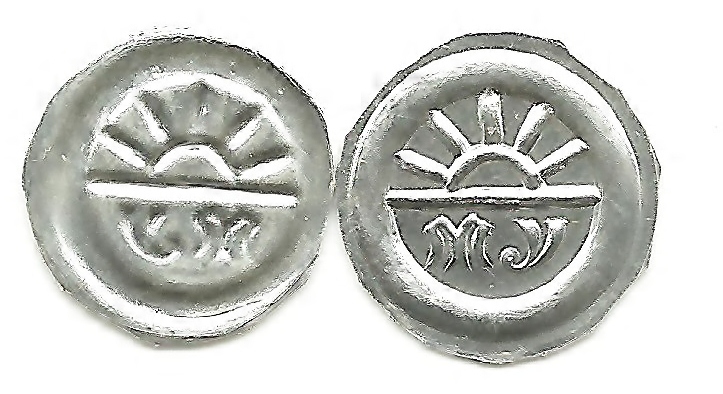 10 sets are already reserved for a museum of Greg's works and those connected in some way to this coin. 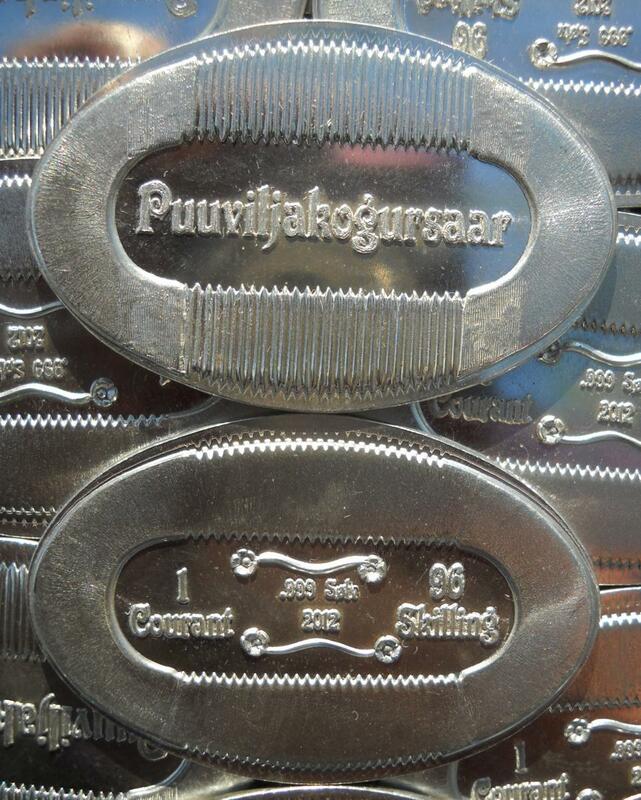 Thus, only 90 will be sold from the first minting. 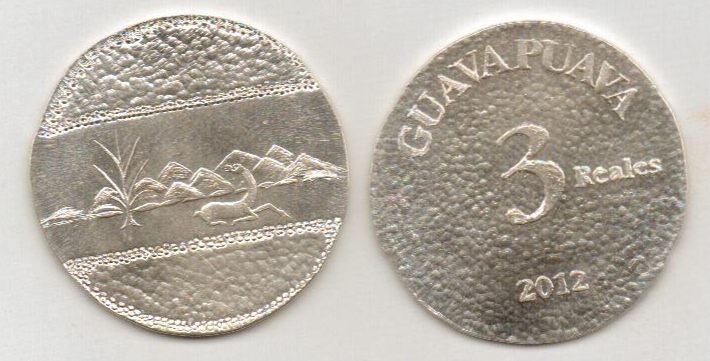 Below is the 1 Real coin of Guavapuava showing both sides. 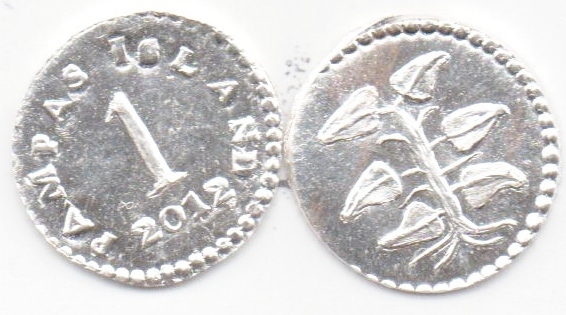 Note the yellow spots are from my the surface of the scanner, not a part of the coin. 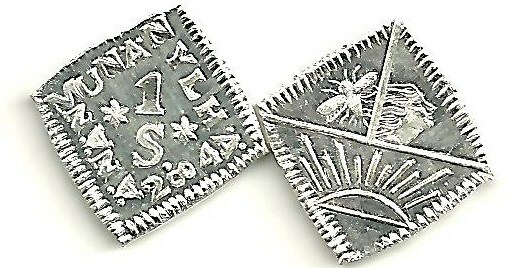 These are 2.17 grams of .999 silver and measure 23 by 15 millimeters. This is the "NAKED DIE". The image is exactly what Greg had completed at the time of his passing. 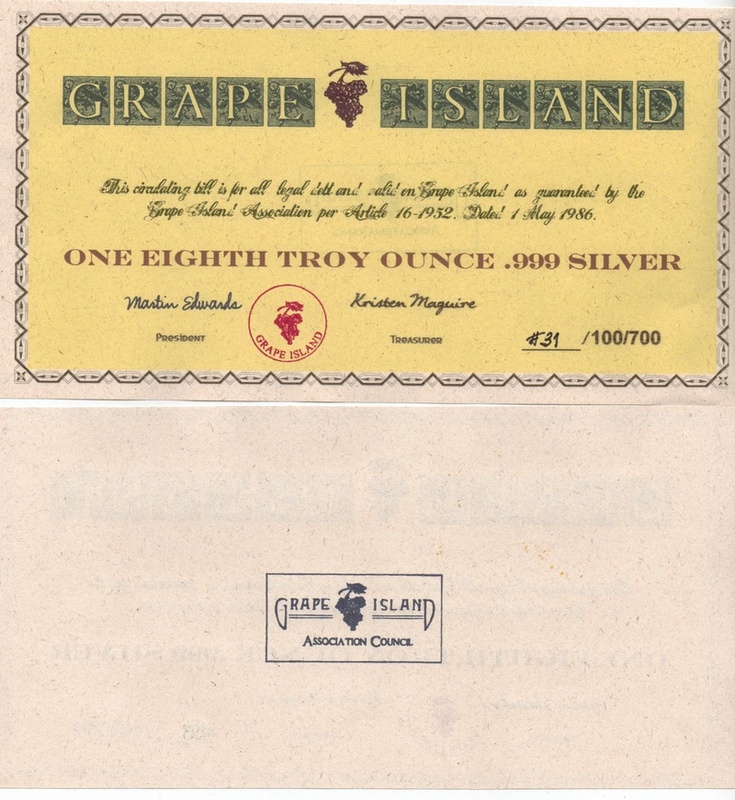 To preserve this final creation, two additional copies of this die were made so the original die would not be utilized for minting the coins. 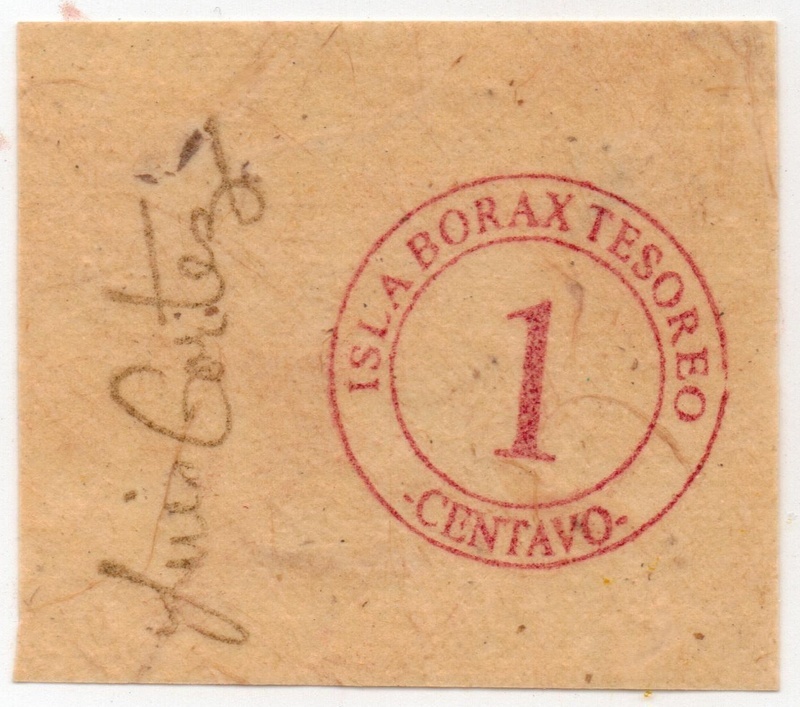 This original die was returned so it may be preserved for the museum of Greg's works. These are GREG'S SWANSONG RELEASE! 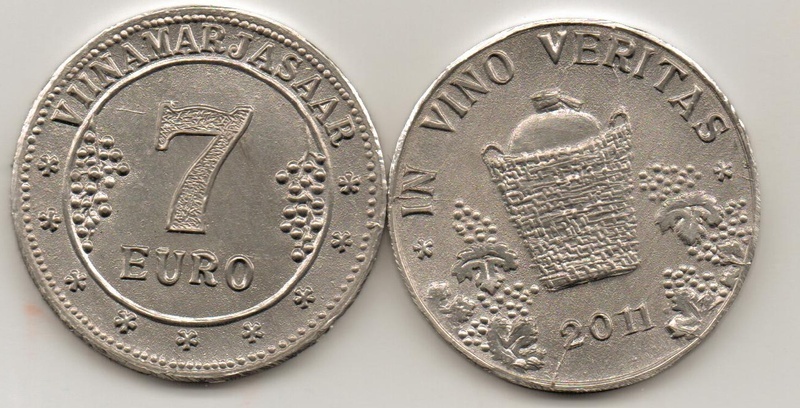 VIINAMARJASAAR 7 Euro coins have arrived. 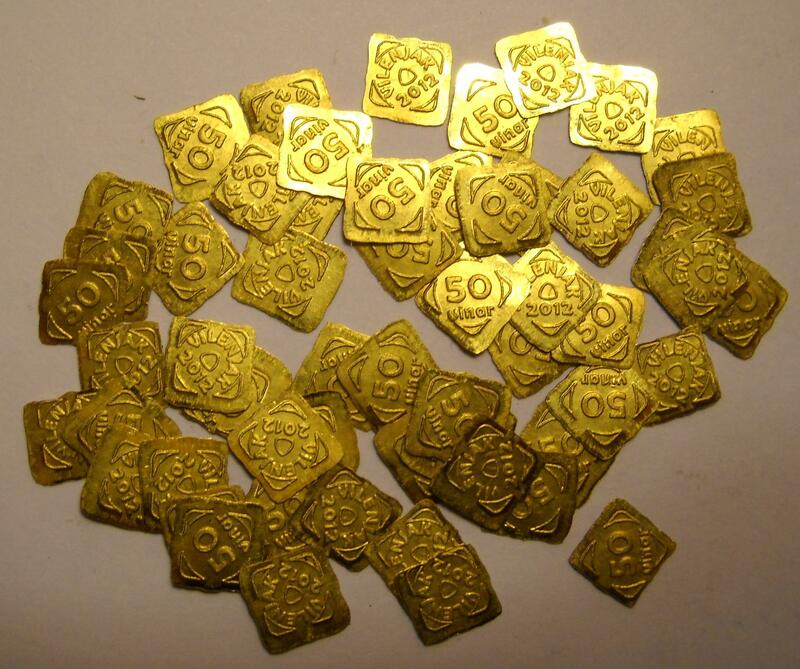 Only 20 in copper, 20 in brass, 10 in copper nickel and 10 in silver are available. See Web Store! 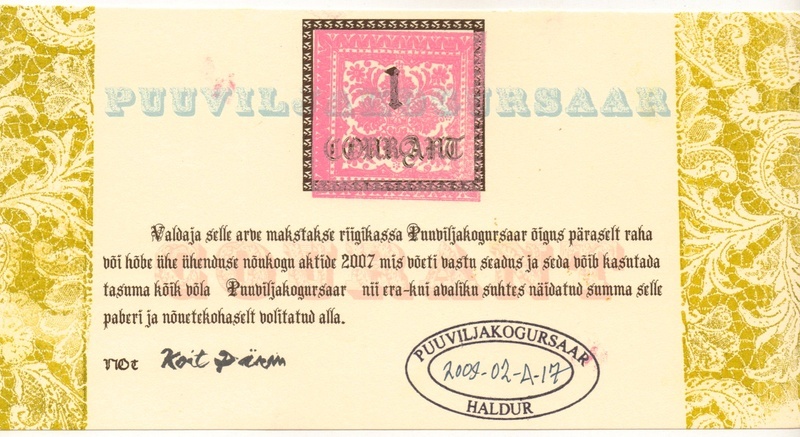 VIINAMARISAAR POSTAGE STAMPS SEEN ON THIS LETTER FROM ESTONIA!!! Thank you Anatoli! 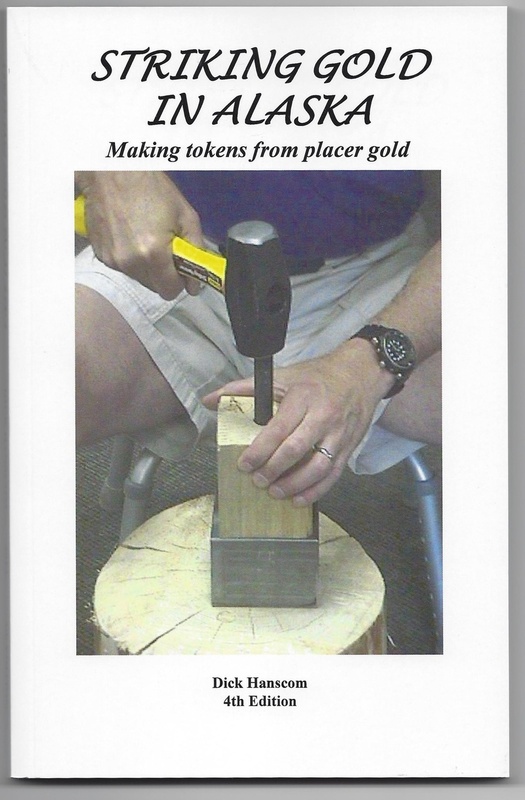 http://www.numismaster.com/ta/numis/Article.jsp?ad=article&ArticleId=22933&et_mid=515755&rid=2204990 THANK YOU FOR THE KIND WORDS! 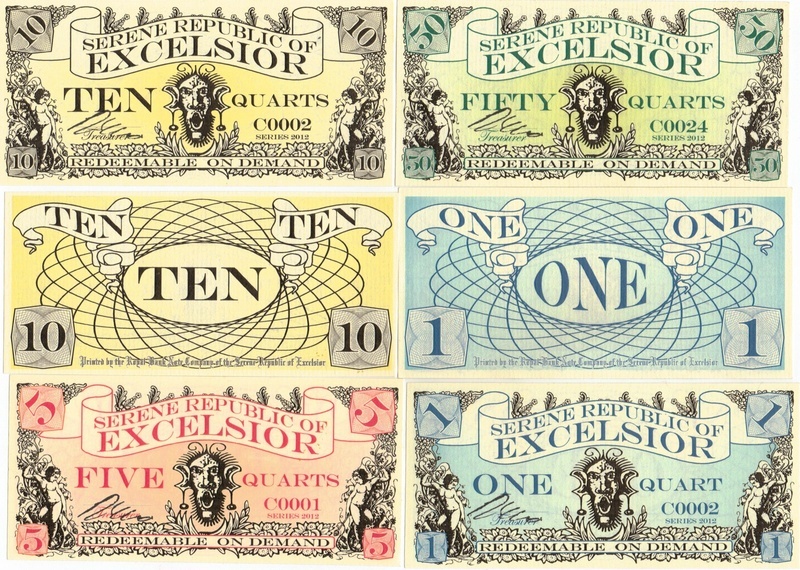 BIG NEWS ALWAYS FOUND IN NUMISNOTES! 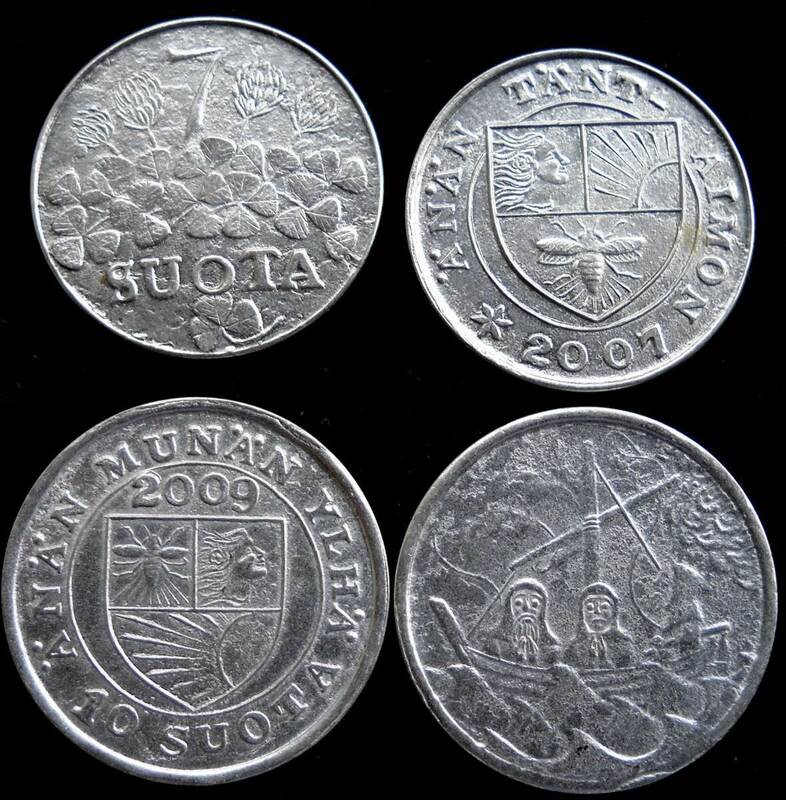 Blue Waters Mint is a small American mint offering coins and banknotes in the ?fantasy coin? realm in very limited numbers. Since 2004 we have offered a handful of releases for a number of real and plausible locations. 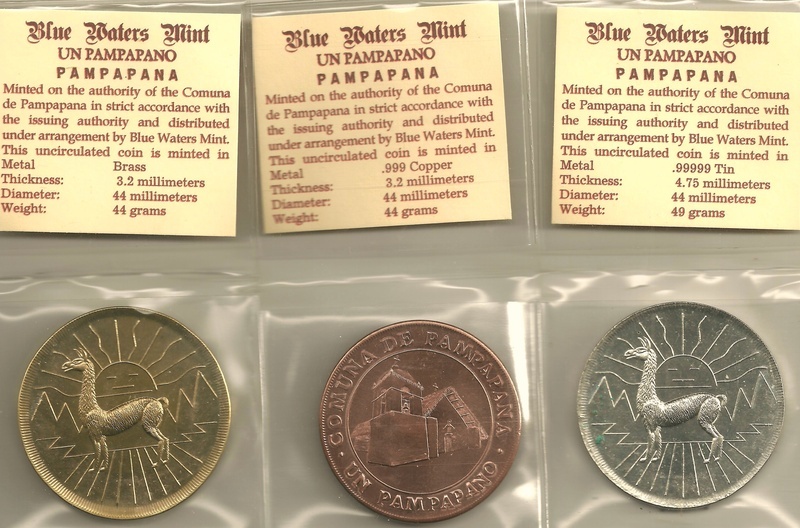 On this site you can read our thoroughly researched articles about these locations, learn more about Blue Waters Mint and even see what we have produced. 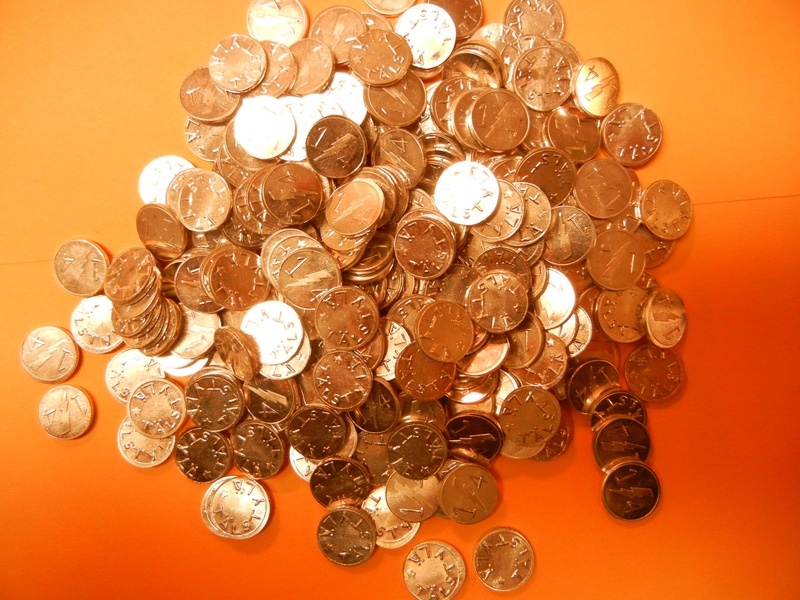 You can purchase coins and paper notes directly from us, saving you money because you are buying direct. We mail internationally. We accept PayPal as well, offering you Buyer Protection, meaning your transaction is secure and safe. Coupled with a stellar reputation on eBay since 1999 and the personal service you receive, we believe you will find your trust in us is earned not only in our unique offerings but our attitude toward our cherished customers. You can see the latest news and get caught up on all the places where we have been commissioned to release coins or banknotes. Please accept this invitation to browse the site. Thank you. MAGI PAIVAINE: 2000 through 2008 - 20 Coin SET!